We last saw Suavity's Mouthpiece, the crooning nerdy punk band from the world of Pittsburgh, where I am also located. That's pretty convenient, though I've only seen this band that one time when we played with them. When I saw they had a new single, I was excited to hear it. Oh, and it is a Buzzcocks cover! And it is live. The cover art is a live photo. It looks nice. I love the blue and gold colors like a New Years party, and the composition excels with its classic, reverent style. I really like the placement of the text on the image. Well done! &lt;a href="http://smpop.bandcamp.com/album/breakdown-live"&gt;Breakdown (live) by Suavity's Mouthpiece&lt;/a&gt; "Breakdown", originally by the legendary UK punkers Buzzcocks on their debut EP, Spiral Scratch, is presented here live by the Suavities from a show they played on August 11th, 2018 at Hambone's here in the Steel City. This was apparently their 10th-anniversary gig, and, though I did not see it, we have this artifact of recorded media from that time. The sound is much less ramshackle compared with the British original with Howard Devoto on vocals. This one is slower and less scratchy, less furious. It's got a sinister urge behind it, a Devolution based edge of damaged Danzig. It's far different from what you might expect, though it's not like a lounge or death metal version or something. The songwriting of the late Pete Shelley and Devoto remains. My only real gripe is the odd boost in volume towards the end that comes in awkwardly. That's how it goes sometimes live though. The B-side is "I Am A Goddamned Bird", a beautiful sounding reverb of nightshade, the sound of 80s Pittsburgh come thru the night's window, creeping under curtain to be heard, possibly, on the wooden floor unassumingly. "Was that something that shouldn't be?" calls out the boy to come to the conclusion that it must have been the house settling or some such. I love the guitar tone in this song so much, vibrato morphing and all. The lyrics come thru with Nirvana references in an even more cynical shade than Cobain. It ends, and I want more. I'm sure I will get more in the future. It is the nature of the future to give us more and more. This is the capitalist, consumerist state. Sometimes it works; sometimes it doesn't. 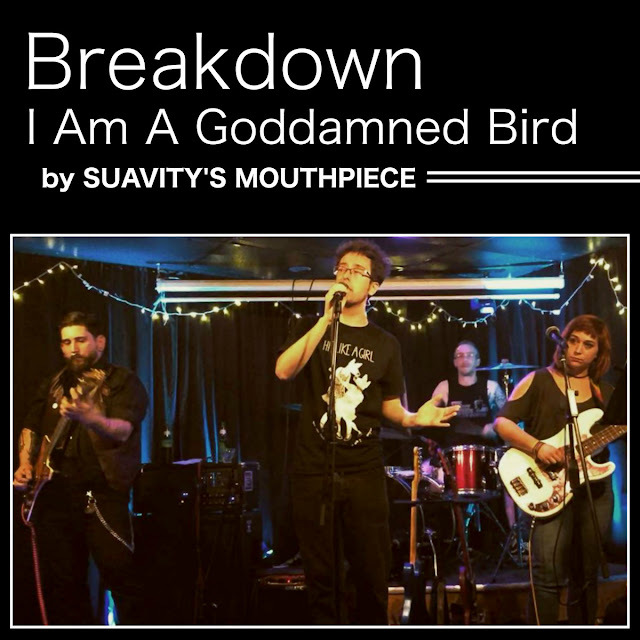 Suavity's Mouthpiece are a post-punk band from Pittsburgh, and their new single is Good.